When it comes to different areas of life, some people may not value your opinion that much. For instance, when I got married and bought a house, other people had a lot to say. I didn’t pay attention their opinions because it was a personal choice and I stuck to my values. However, plenty of people do value your thoughts, and you might even get paid for your opinion. Many companies perform market research by getting feedback from everyday consumers like you. They use the information to form, update, and improve their products, services, and marketing. This demand makes it relatively simple to get paid for sharing your opinion. You don’t need any experience or fancy certifications. If you like to talk to others and speak your mind, you’ll have plenty of options for making extra money. It’s easy to get paid for your opinions. You can get paid for online surveys or by participating in local focus groups. The time commitment varies from only a few minutes to several hours. You should expect your compensation to adjust accordingly depending on the time you give. Here are some of the best ways to get paid for your opinion on products and services. One of the most popular ways to get paid for your opinion is taking online surveys. Online surveys are relatively simple, and you can usually take them on your phone. Most sites will allow you to register if you’re at least 13 years old. There aren’t many other requirements to sign up and get paid for online surveys. After registering, you receive survey options based on your profile and experience. You take them and earn rewards to redeem for cash. Make sure to completely fill out your profile to ensure you get as many offers as possible. There are a lot of survey sites out there. I’m sure you’ve probably heard of some. Make sure to pick legitimate survey sites so you don’t waste time or open yourself up to a scam. When comparing survey sites, you want to sign up with one that consistently sends out survey offers covering a wide variety of topics. Since you may not qualify for every survey available, it helps to use a site that offers variety. You also want to consider payment options. Some sites will pay you via points, which is fine, but you may not want to wait until you have 10,000 points to cash out your earnings. Other sites try to work around properly compensating users by offering them a chance to enter into a ‘sweepstakes’ in order to win prizes each month. Contests are nice, but if you’re taking time out of your day to complete surveys, you should receive guaranteed compensation for this work. Survey Junkie – Easy to use and you can redeem your earnings once you reach 1,000 points (equivalent to $10). Survey Junkie is one of the best sites if you want to start earning money as soon as possible. Check out our Survey Junkie review to see how it works. Pinecone Research – Pays $3 per survey which is pretty competitive compared to other sites. They also pay you $3 when you first sign up. InboxDollars – You can make money on this site by taking surveys or doing other activities like playing games online, downloading coupons, or reading emails. Harris Poll – Legitimate company that has been around for 50+ years and is best known for their political polling. You can take politically-based surveys or surveys on a variety of other topics. Global Test Market – Global Test Market is one of the largest survey sites in the space, spanning over 100 countries. You make money answering surveys on experiences you have at a particular restaurant to shopping and more. You can make money taking surveys, but they won’t make you rich. If you want to get paid for your opinion, taking surveys offers a good way to put a little extra money in your pocket. A focus group is a form of market research where a company or brand recruits a group of people to discuss topics related to their business or product. The idea behind focus groups is gaining authentic insight and feedback from real consumers. I attended my first focus group in college and I had no idea what to expect. Since I needed money, I went to Chicago, sat in an office with a group of women and talked about hair products for an hour. Upon leaving, they handed me $100 cash in an envelope. Super easy! Recently, my husband and I have been looking to make extra money to pay for a tree removal service for our house. We don’t want to consider our emergency fund as a first option, so we started looking into focus groups. My husband received approval to participate in one where he’ll share his opinion about insurance. It pays $125! This motivated me to sign us up for more focus group sites. To find focus group opportunities, you need to sign up online just like you would for a survey site. You generally need to be pre-selected to participate in a focus group, and the process starts by filling out a quick survey. If your profile matches what they’re looking for, you’ll be selected for a phone call interview prior to scheduling the focus group. Be mindful that some sites compensate differently and this may depend on the company who’s paying to host the focus group. While some might offer cash payouts, others may provide you with a Visa card loaded with the payment or a paper check. Participating in focus groups can be a great way to get paid for your opinion on products and services. Remember, though, that you won’t qualify to participate in every focus group you apply to. Giving reviews offers another way to get paid for your opinion. Reviewing products and services is easy and again, all you need to do is share your honest thoughts and feedback. Most people already do this, but for free. Whenever you post on social media about a place you visited or product you used or share your thoughts on a business’s Yelp page, you’re leaving a review. UserTesting – This site pays you to leave video reviews of different websites. You’ll get $10 per 20-minute review. UserFeel – This site is very similar to UserTesting. You can double your opportunities to make money by signing up for both. SponsoredReviews – This site is an option for bloggers who are looking to write more sponsored posts. Review Stream – You can review nearly any product on this site. You get paid to write the review and you also earn a bonus if a user votes for your review and finds it helpful. Software Judge – This site pays you up to $50 for honest reviews on the digital software you use on a regular basis. As you can see, your opinion can be very valuable – maybe worth hundreds of dollars per month. We are all consumers in some capacity so it makes sense to get paid for your opinion to make extra money. Many people think it’s difficult to make extra money but it’s not. Getting paid for your opinions on products and services is one example of how simple it can be to make extra money. Sometimes, all it take is a few minutes of your time to earn extra cash for your budget. What ways have you tried to get paid for your opinion in the past? Do you have favorite ways to make extra money? What warning signs do you look for in money making opportunities? 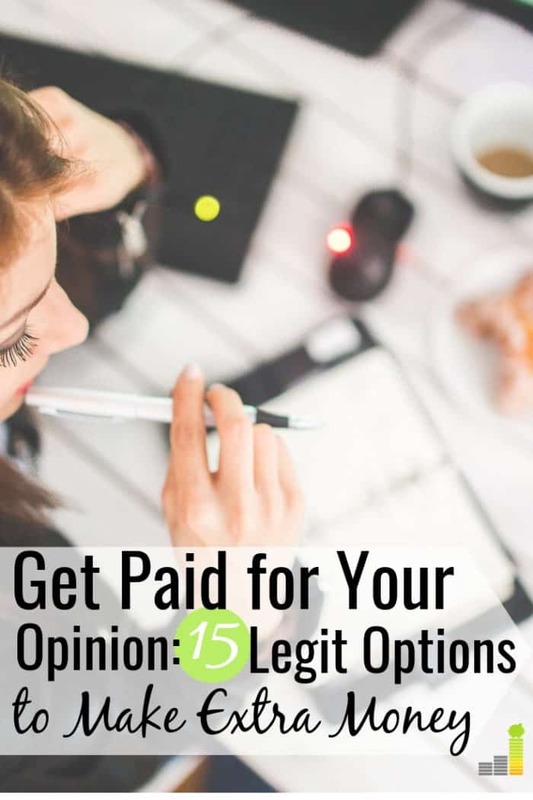 The post How to Get Paid for Your Opinion: 15 Ways to Make Extra Money appeared first on Frugal Rules.